The Rare Plant Conservation Program at Bok Tower Gardens is committed to rare plant preservation. “Conservation in Progress” is a bi-annual summary posted on our website as a rare plant informational tool for website visitors. The only natural population of Savannas Mint has only roughly 20 plants remaining and is located on private property slated for housing development. To help prevent extinction, the Rare Plant Conservation Program has been working to introduce new populations onto protected park lands. Starting in January 2015, propagation of new plants from seeds and cuttings began, and by July, there were over 1,000 plants in the greenhouse at Bok Tower Gardens that were flagged, assigned number tags, and ready to be transported to their new home. 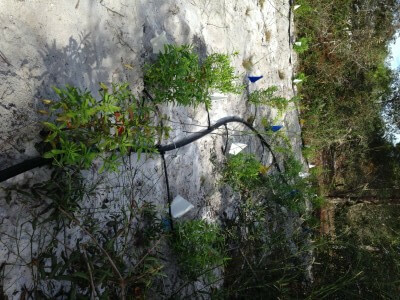 Over two days in the summer, with the help of many volunteers and park staff, 990 plants were introduced into the park. Irrigation lines were set up to each plant to provide water for several weeks and help them become established. The individual number tags will help Conservation Program Biologists track survival and demographic data each year. Environmental stresses and genetic changes can each affect plants in numerous ways, especially small populations of rare plant species. When physiological characteristics such as flower size are affected, it can have extreme consequences on the survival of the species by altering nectar and pollen production and change the foraging activity of pollinators. There is only one small (8-22 plants) natural population of Savannas Mint (Dicerandra immaculata var. savannarum) in existence. Since 2006, we’ve collaborated with the Florida DEP and introduced three new populations onto protected park lands. The new populations have 1,000 – 2,500 plants each and are thriving, while the natural population continues to decline, facing pressures of habitat degradation, harsher environmental conditions and possible inbreeding depression. The healthy plants in the new populations appear more robust than those in the natural population, but this had not been explored. In October 2015, a new study was initiated to look at the variation in flower size between the natural and two of the introduced populations. 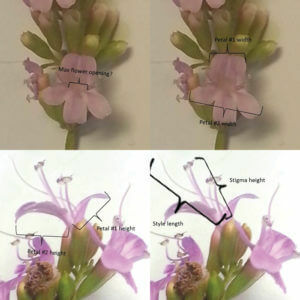 Measurements were taken on stigma and style length, petal length and width and maximum flower opening. The results showed that the natural population has significantly smaller flowers than the introduced populations, and that flowers were bigger on plants growing in sunnier areas. A study is planned for October 2016 to see if flower measurements are associated with other habitat parameters such as leaf litter. 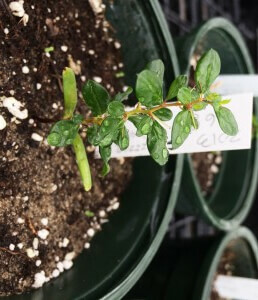 This very rare species, Ziziphus celata, is found only in Polk and Highlands Counties and was once thought to be extinct. Work within the Rare Plant Conservation Program over more than two decades has allowed clones of most of these populations to be brought into the National Collection growing beds at Bok Tower Gardens. In these beds, the different genotypes from the different populations can openly cross-pollinate, and each May thousands of seeds are collected from the growing beds. Germination trials on these seeds are important to assess changes in viability over time, how best to store the seeds, to optimize propagation methods and to detect variation between maternal genotypes. In fall 2015, a germination trial was initiated to look at the effect on germination rates when seeds were treated with liquid smoke, which can mimic the chemical effects of fire. Additional trials are also underway to compare viability of freshly-harvested seeds with that of seeds stored for at least one year at -20˚C and 7˚C. Indian River County biologists, Bok Tower Gardens and the U.S. 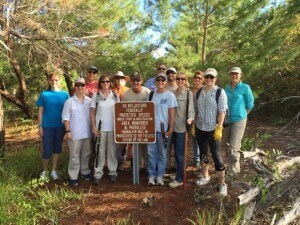 Fish and Wildlife Service’s Vero Beach office coordinated a work day in November 2015 to improve part of the habitat for Lakela’s Mint in Vero Beach. Lakela’s Mint (Dicerandra immaculata var. immaculata) is one of the rarest plant species in the world, and the last remaining populations are threatened with declining habitat conditions because they are located in populated areas which are challenging to manage with the prescribed fire habitat maintenance needs. In lieu of fire, the habitat must be maintained manually, which requires substantial volunteer effort on a regular basis. The November 2015 event was scheduled as part of a service day for the federal employees to work in the field to support their community for a day. Eleven USFWS staff members met with biologists from Indian River County and Bok Tower Gardens. The crew performed hand-weeding of grasses, raking of excessive leaf litter, and the removal of limbs, overgrowth, dead branches and fallen debris. The site previously contained numerous Lakela’s Mint, whose numbers had severely declined in that area due to overgrowth of competitor species and a buildup of litter and debris. The work day greatly improved habitat for Lakela’s Mint in that area. Staff enjoyed the rare work day outdoors, and because of the day’s success, discussions are in process to make this an annual even for USFWS staff, and to schedule additional, similar work days for the general public. 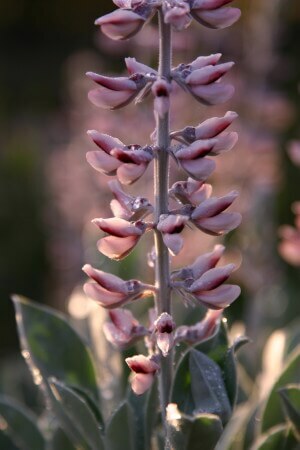 Genetic analysis within and between the populations of Scrub lupine (Lupinus aridorum) has been underway through a collaboration between Bok Tower Gardens and the lab of Dr. Christin Pruett at Florida Institute of Technology. In 2012 and 2013, DNA was extracted from leaf samples of all populations, and microsatellites specific to this species were developed. The microsatellites were then used to examine the level of diversity within Scrub lupine populations. Diversity assessments are important to understand the genetic threats to the species, since there are only very few, small, isolated populations that remain, and also to address several key issues important to conserving this species. A main issue is what source of seeds to select for new populations. One of the main tasks outlined in the federal Recovery Plan is to create new populations on managed, protected lands. If a natural population is imperiled by lack of genetic diversity, recreating this population by using only its germplasm to establish a new population may not be sufficient to create a healthy, self-sustaining population to meet Recovery Plan goals. Another issue is one of taxonomy: although most sources list L. aridorum as a unique species, the IUCN and several other sources consider L. aridorum to be a subspecies of L. westianus. The results of this work suggest that the healthiest population might best be created from mixing germplasm from the remaining populations. Each of the populations have very low genetic diversity at present, and a couple may themselves not persist without augmentation. The low number of plants in some populations seems to be leading to self-pollination, so these populations are a priority for conservation action. The data also suggests that L. aridorum is a separate species than L. westianus.